For the Irish Roman Catholic priest, see Martin Glynn (priest). For the Canadian Olympic bobsledder, see Martin Glynn (bobsleigh). Martin Henry Glynn (September 27, 1871 – December 14, 1924) was an American politician. 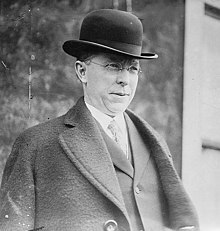 He was the 40th Governor of New York from 1913 to 1914, the first Irish American Roman Catholic head of government of what was then the most populated state of the United States. Glynn was born in the town of Kinderhook, N.Y., and grew up in Valatie, one of Kinderhook's villages. He was the son of Martin Glynn (son of Martin Glynn and Catherine de Burke) and Ann Scanlon, who were both born in Ireland. He graduated from Fordham University in 1894, then studied at Albany Law School of Union University, New York, and was admitted to the bar in 1897. From 1896 on, he wrote for the Albany Times-Union daily newspaper, becoming eventually its editor, publisher and owner. In 1898, Fordham awarded Glynn the honorary degree of master of arts. Over the course of his career, Glynn received honorary LL.D. degrees from Fordham, Syracuse, Georgetown, and Union Universities. Glynn as a Congressman in 1901. Bain Collection, Library of Congress. Glynn was elected as a Democrat to the 56th United States Congress, and served from March 4, 1899 to March 3, 1901. When he took his seat at age 26, Glynn was the youngest member of the House. He was New York State Comptroller from 1907 to 1908, elected in 1906, but defeated for re-election in 1908 by Republican Charles H. Gaus. 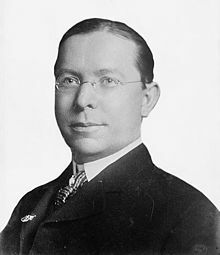 He was elected Lieutenant Governor of New York in 1912 on the ticket with William Sulzer, and succeeded to the governorship upon Sulzer's impeachment and removal from office in 1913. He was the first Catholic New York governor, but was defeated for re-election by Charles S. Whitman in 1914. He was a delegate to the 1916 and 1924 Democratic National Conventions. As the keynote speaker at the 1916 National Democratic Convention, Glynn delivered one of his most famous speeches, praising the accomplishments of President Woodrow Wilson and the platform of the Democratic Party. Martin Glynn was active in the Progressive movement and had an interest in Irish-American affairs. Glynn committed suicide by gunshot in 1924, after having suffered throughout his adult life from chronic back pain caused by a spinal injury. Though the cause of death was listed on his death certificate, the local media reported that Glynn died of heart trouble. The true story of his death was publicized in Dominick Lizzi's 1994 biography. He was buried at the St. Agnes Cemetery in Menands, New York. Glynn's article "The Crucifixion of Jews Must Stop!" was published in the October 31, 1919, issue of The American Hebrew; in it he lamented the poor conditions for European Jews after World War I. Glynn referred to these conditions as a potential "holocaust" and asserted that "six million Jewish men and women are starving across the seas". Robert N. Proctor says that "[this] oddity has been exploited by Holocaust deniers but is simply a remarkable coincidence and nothing more." ^ Holmes, Frank R. (1924). Who's Who in New York City and State. 8. New York, NY: L. R. Hamersly Company. p. 513. ^ a b Who's Who in New York City and State, p. 513. Wikimedia Commons has media related to Martin H. Glynn.